1- Normal Calculator for quick and perfect simple calculations. 2- Scientific Calculator with almost all advance calculation features which support 3 modes of calculation-Red ,Deg and Grad. 3- Age Calculator to calculate Age in years , months,days,hours,minutes . 4- Unit Convertor – Allow you to convert between more than 20 physical Units and their subunits with 20 digit accuracy . 5- Currency Converter allows you to convert various currency by retrieving current currency rates from internet. 6-BMI Calculator allows you to calculate Body Mass Index points and show your BMI in human readable/ Understandable formats . 7-Expression Calculator is brand new tool added to supercalc in last update that allows you to solve complex equations and expressions. 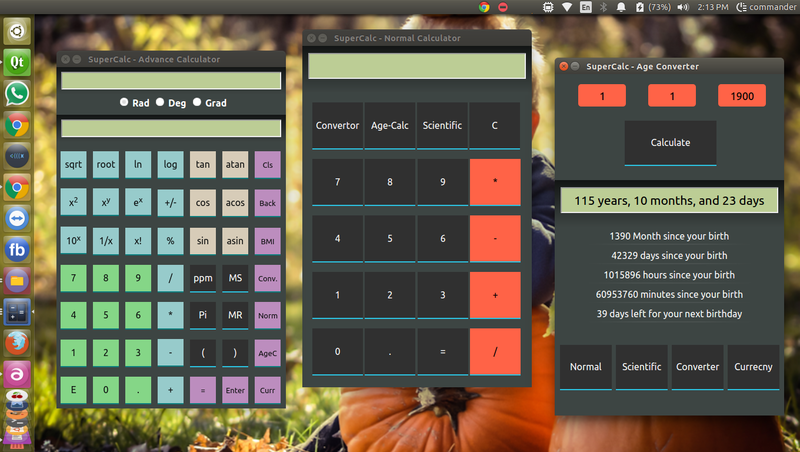 8-Navigation is a new feature in supercalc that allows you to run multiple session of particular tool within one window , you can navigate back and forward and open more than 40 sessions/tool without loosing your data and calculations you doing in them . 9- Supercalc come with themes , you can modify appearance of particular tool you are using with brand new theme toggle option . 10- Every tool of SuperCalc can be accessed using keyboard shortcuts which makes it very fast for user to switch.